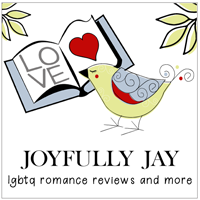 Big Gay Fiction Podcast – Episode 54 – GRL Preview with Joyfully Jay! GRL Blog Tour With Ethan Day! More! The guys take a moment to say hello to any new listeners who may be sampling the show after Jeff & Will’s interview with Joanna Penn appeared on The Creative Penn podcast, which was later given a shoutout on the Sell More Books Show. BGFP Coloring Pages make their debut this week. Listeners who are already on the email list received theirs on Monday. Anyone can get coloring pages by subscribing to the BGFP monthly newsletter (the sign up box is at the top right corner of this page). Spirit Day is Thursday, October 20. Listeners are encouraged to participate to take a stand against bullying. BGFP’s one year anniversary is just a couple of weeks away. Jeff & Will would love to know what your favorite moments are and what you’d like to hear more of in the new year. You can leave a comment on the shownotes page. Ethan Day stops by as part of the 2016 GRL Blog Tour to talk about his upcoming Meteor Springs series and what he’s looking forward to in Kansas City. Jeff & Will mention where they can be found during GRL, and what they’re excited about for the weekend. Jay from Joyfully Jay also gives the scoop on what she’s doing at GRL and offers up some fall book recommendations. Happy to give you guys a shoutout. Keep up the great work!